For generations, young people have been drawn to and dared by the Upper Ammoonsuc Falls. Most beat the odds with death defying jumps off 25' high rocks into the turbulent waters below, some though, have not been so lucky or skilled - and they too have become part of the allure and mystique of this place. 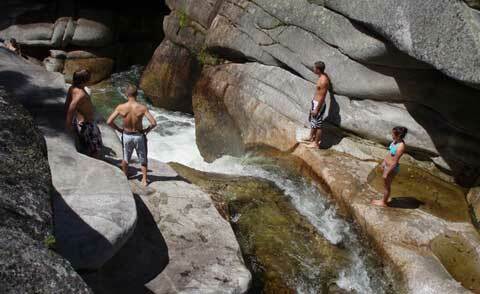 Upper Falls is one of the most beautiful, popular, and dangerous natural swimming holes in the state. Part of its attraction is its accessible location near the Mount Washington Hotel and Resort and foot of the highest, most lethal peaks in the Northeast. The line between luxury resort and rugged wilderness are blurred by proximity and history. The Resort once owned and utilized the land that includes the falls, but transferred ownership to the White Mountain National Forest as policing and liability became troublesome issues. The falls are geological gem created over millions of years by ice and continue to be sculpted by the constant flow of water. The story of the Falls begins at the summit of Mount Washington. Ice cold water crashes down the western side of the mountain near the Cog Railway base station through a tributary brook called Deception, and then pours through a series of falls, basins and gorges that make up the Upper Ammonoosuc River. 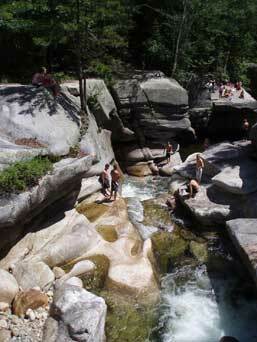 The Upper Falls includes three swimming holes that lie just below a foot bridge. At first the sight, the two larger pools are most awe-inspiring. There is a sharp contrast between the high cliffs, the tight river and the wide, clear mountain pools, and then, in an instant, and only yards away; it turns into a serene ankle to knee high babbling stream. Most of the acrobatic jumping and diving occurs in the two lower pools often with an audience of sun bathers and on-lookers enjoying the spectacle. It is easy to miss the small pool that swirls at the bottom of the 6 foot waterfall. When the water is high, white and frothing, powerful hydraulic forces develop that can pull the unsuspecting swimmers down and hold them there. This is precisely what happened to as many as a dozen young men in the last 40 years. An examination of the newspaper accounts of many of these incidents shows that most were from away, unfamiliar with the risks, inexperienced with natural swimming, this particular spot, and some were under the influence of alcohol or drugs. For much of the 1960-90s, this area developed a reputation as a popular partying spot for adolescences and young adults, a mix of locals, resort employees and tourists. On a warm weekend, it was routine to have 50 people gathered here. Upper Falls became a perilous "rite of passage" for young men, said Dr. Campbell McLaren, an emergency room physician in nearby Littleton Hospital for over 30 years. "The combination of heat, girls and beer is dangerous. With adrenaline pumping, cognitive ability to make reasoned decisions and evaluate risks is reduced by two-thirds." Since then the number of drowning seems to have dropped off, possibly as a result of the deaths or the posting of the property by the Mount Washington Hotel. The signs did not deter swimmers and policing it became "an endless battle" said John Gardiner, who served as Twin Mountain's Police Chief for 21 years. "We were always being called (by the hotel security.)" This led to Twin Mountain ending its policing relationship with Crawford's Purchase, an unincorporated town with no residents. In the late 90s, the falls ownership was transferred to the Federal government and the land was opened to the public. Shortly, thereafter two highly publicized drownings and a near drowning brought calls for a warning sign. Fish and Game Lt. Doug Gralenski remarked there are plenty of signs. "The threat isn't concealed," he said, "just look down." The Pemigewasset Ranger Station, which is responsible for maintaining and monitoring Upper Falls, periodically evaluates the risks associated with the site. "The risk," Tom Giles, Assistant District Ranger, "hasn't risen to the point of (it being) necessary (to institute) closures, reroutes or setbacks," They have although put a strict ban prohibiting alcohol (punishable by fines of $5,000 and/or 6 months in prison), erected a simple warning sign and a split rail fence to delineate dangerous access points. The deaths and the warnings never seemed to deter swimming at Upper Falls, to the contrary it became increasingly popular. "The fact that people have died there is some kind of a lure," Jim Covey, head of the Twin Mountain Chamber of Commerce. "It's some kind of morbid curiosity." There are no signs, little parking and no marketing at all, yet Betty Gilman, who runs the local information booth says it is one of the most requested local destinations. "On a hot day," she said, "it is not unusual to have 4-5 car loads of people" looking for Upper Falls. Ms. Gilman quickly added, "But we don't push it." Veteran swimmers say they are drawn to the falls because of the unique natural features, not the morbid history. "It is the real deal and a local phenomenon," said Mark Safian, a Twin Mountain business owner and high school teacher. "(It is a) powerful and compelling series of waterfalls and basins and its fun to swim there. It is (like) a death defying roller coaster made of water. It's thrilling, and if you do it right it is perfectly safe." There are two things you need to know about Upper Falls, said Alex Garneau, a college student from Twin Mountain. "You have to know the (previous week's) weather and know the water always." A random polling of swimmers at the Falls, indicated that most people were aware of the dangers, and had simple ways to evaluate the risks. Tyler Ramsdell, 18 of Whitefield, points to a rock that creates a boundary between the two pools. If he can't see it because of elevated water levels, he stays away, not only because of the currents but also the risk of hitting shifting rocks and debris. Others warning signs included white, aerated, and unclear water and never swim in the spring, when water is typically high and always cold, so cold says A.J. Smith, 20, of Whitefield, "that you can't catch your breath." Many veteran swimmers have had or have witnessed others having trouble that could very well have ended tragically. 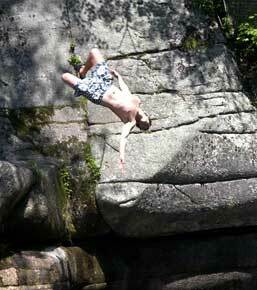 Skilled in the outdoor recreation, Luke Long, of Pottstown, Penn., was at the falls on a summer day in 2002 that was so miserably wet that the swimming area was empty. A man appeared at the top of the ledge and, Mr. Long and his friend, looked at each other in amazement, and Mr. Long said, "he's not going to jump in right now." Jaws dropped; they watched Paul Healy, 38 of Woburn, Mass, "dive so perfectly into the aerated pool that he melded into it." He came up and was in "a panic, struggling and flailing loudly." Mr. Long went for his rescue gear and sent an on-looker to the Cog for help, then in a moment Mr. Healey surfaced again "looking fatigued and scared." Then he disappeared for good. Mr. Long hoped that Mr. Healey found safety in the above water cave behind the falls, but a few minutes later he was "flushed out into the lower pool." Mr. Long pulled the life-less body to the rocks and began CPR. Mr. Healy was not breathing, but in time, was resuscitated. Veteran natural swimmers, like Mr. Long, say the "biggest mistake people make (when caught in a whirlpool) is to swim toward the surface." It is an impossible task, he says, "you have to swim down(ward) and let the current spit you out." "The bottom line is," said David Warren, college student from Twin Mountain, "you just don't mess with mother nature." Most observers agree that the trends are toward more responsible use. Dr. McLaren, who tracks high risk activities and places, says "maybe enough talk about (the dangers of the falls) has caused more careful behaviors." Charlie Kenison, who runs the nearby Cog Railway has been visiting the falls for 47 years, was impressed with the cleanliness during a recent visit. "I saw nothing on the grounds," said Mr. Kenison, "not even a gum wrapper." Twin Mountain Fire Chief Jeff Duncan cautiously concurs. He typically responds to reports of drowning, but none during the last year or so far this year. When responding to calls, he has rarely seen any evidence of alcohol use or accidents resulting from divers hitting rocks Most of the calls come early Saturday afternoons. Notwithstanding the recent trends, Chief Duncan still worries, especially with all the rain that has fallen recently, and historically most problems occur around the cusp between July and August. "Based on history" he can't help but worry. "This is peak time." he said, "You almost expect it."